How the Russian authorities are justifying the military’s pivot to the south east. 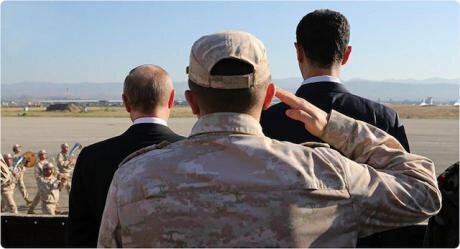 Syrian President Bashar al-Assad and his Russian counterpart Vladimir Putin view a military parade at the Russian-run Khmeimim Air Base, December 2017. Photo: Syrian Presidency / Xinhua News Agency / PA Images. All rights reserved.In August 2018, Russia’s fleet in the Eastern Mediterranean conducted major naval exercises, confirming the Sea’s newfound – or renewed – importance to Russian strategy and power projection. The 2014 military doctrine and the new National Security Doctrine, as well as the 2015 Maritime Doctrine, mention the Eastern Mediterranean as a region of influence, setting a goal of a permanent Mediterranean presence that would include one or two multi-purpose vessels and 10 to 15 surface ships. This presence is part of Russia’s broader plan to transform from a “green water” navy into a “blue water” one, capable of operating in open waters. As Russia seeks to shore up its southwestern forces, it has seen a recent success on the Caspian front. Under Russia’s initiative, the five littoral states – Russia, Iran, Azerbaijan, Kazakhstan and Turkmenistan – finally managed, in August 2018, to sign a collective agreement resolving some of the territorial delimitation issues that had hampered regional cooperation for 25 years. (The issue of seabed division, however, has yet to be settled.) But the real geopolitical accomplishment of the meeting was banning non-littoral fleets, reassuring Russia (and Iran) that there will be no U.S. military presence on the Caspian Sea. Moscow’s expanded footprint in the Black Sea and its new focus on the Eastern Mediterranean should also be articulated with Russia’s foreign policy toward Turkey and the Balkans. Seen from the Kremlin, Turkey, even if it remains an uneasy partner, offers a unique opportunity to disrupt NATO solidarity mechanisms and US policy in the Middle East. The Balkan states – whether EU members such as Greece, Cyprus (where Moscow tried to get access to military bases for refueling operations and emergency situations), and Bulgaria, or potential candidates such as Serbia and Montenegro – present themselves as some of Europe’s weakest links, both in terms of their privileged relationship to Russia and their cautious attitude toward decisions made in Brussels. For Moscow, the Balkans has become a critical new point of power contestation with the EU behind the Eastern Partnership countries. But there is more to the story than foreign policy decisions and postures. Russia’s turn to the Mediterranean is a structural and long-term reorientation of the Russian state toward its ancient roots in the Black Sea region. Domestic demographic trends that show the Russian population’s move toward the more prosperous western and southwestern regions (with, for instance, Krasnodar being one of the fastest growing cities in the country) reinforces the geopolitical weight of Russia’s own Black Sea facade. To this should be added, obviously, the annexation of Crimea, its integration into the Russian Federation and the heavy cost thereof (at least US$5 billion annually). To anchor the peninsula in Russia and make any return to Ukraine impossible, Moscow has to invest massively in reconnecting the region to the rest of Russia, not only in terms of logistics and administration, but also at the symbolic level. The Kerch Strait Bridge – inaugurated by Putin in May 2018, seven months ahead of schedule – illustrates the logistical reconnection to Russia’s territorial body. The unique status being given to the region is epitomised by the transformation of Sochi into one of Russia’s capitals: the city hosts high-level summits and personalities with a frequency eclipsed only by Moscow and St Petersburg. The Russian authorities have also made an array of symbolic gestures: reshaping the logo of the Crimean republic for tourism purposes; integrating the peninsula and Sevastopol into the new banknotes, released in 2017; funding a massive rebranding of Crimean products, from wine and jams to soaps and teas; and securing preferential procurement for state institutions (Alexey Navalny denounced, for instance, the fact that the Russian National Guard buys Crimean products at well above market price, indirectly subsidising the peninsula’s economy). To articulate foreign policy objectives and a “civilisational” branding that is now an integral part of Russia’s image-making, the Kremlin insists on a posturing as the authentic Europe, the “true” Europe of conservative and Christian values, whose spatial materialisation would be continentalism (a Paris-Berlin-Moscow axis) rather than a pro-US Atlanticism. Far from being only a superficial geopolitical posture, the desire to appropriate Europe’s humanist traditions has shaped Russia’s recent cultural policies and their move toward the Mediterranean. The Mariinsky Orchestra’s open-air concert in liberated Palmyra in May 2016 was a symbolic act of reconnection with Antiquity. As analysed in detail by Maria Engstrom as part of what she calls the “new Russian renaissance”, the country’s new exhibition policy has stressed this Ancient European heritage with a range of cultural events, among them an impressive exhibition of the Vatican’s Pinacoteca masterpieces. The current celebration of Russia’s Orthodox identity as being in close interaction with its Western counterparts, from a prestigious Roman past to the Italian Renaissance, is a clear break with the previous policy of confrontation. Another insightful example of that trend is the Russian Geographical Society-funded archaeological expedition to Akra, a sunken city in the waters of the Black Sea, a way to celebrate Russia’s reunification with its Bosphorus legacy via Crimea. The branding of the sunken city as a “Crimean Atlantis” epitomises the mythological process currently underway around Russia’s rediscovered Pontic identity. At least the expedition looks more serious than the orchestrated “discovery”, by a scuba-diving Putin himself, of two alleged Greek urns on the floor of the Black Sea in 2011, a bold propaganda event ridiculed by the Russian blogosphere. Orthodoxy also plays a pivotal role in Russia’s new Mediterranean entrenchment. A privileged and centuries-old relation to the Greek and Pontic realms, as well as the protection of Eastern Christians since Ottoman times, are powerful historical memories that can easily be updated. In this sphere, too, efforts have been accelerated in recent years. The Syrian civil war pushed the Moscow Patriarchate to display Orthodox solidarity, to the point that in 2013 it is said to have supported 50,000 Christian Syrians in their applications for Russian citizenship as a sign of Russia’s commitment to protecting Levantine Christians. But this policy has unexpectedly been challenged by the Constantinople Patriarchate’s decision, in October 2018, to recognise the autocephaly of the Ukrainian Church. The administrative, political and theological imbroglio of giving autocephaly to a Church that did not ask for it, of the Ukrainian government pushing for it at risks of dividing the local parishes, and Moscow’s decision to cut links with one of the most respected, but geopolitically minor, Patriarchates, deeply shake the already troubled Orthodox waters. This move toward an unprecedented religious schism threatens to weaken Russia’s recently rebuilt legitimacy as a Pontic power, intimately connected to past and present Eastern Christianity. Russia’s geopolitical heart beats harder in Europe than Asia. It is in Europe that Russia feels its great power status confirmed or denied: the tensions in the axis between the Baltic Sea and Ukraine are a vivid testament of it. Second after this northwestern flank comes the southwestern one, with renewed tensions in the Black Sea and Russia’s revamped security role in the Eastern Mediterranean. Yet whereas the Baltic Sea-Ukraine axis does not necessitate a rediscovery of Russia’s “northern” identity, the Black Sea theater has inspired an intense rebranding of Russia’s centuries-old Pontic identity.